Residents poured out of the Thai capital by bus, plane and train today, heeding government warnings to use a special five-day holiday to evacuate parts of the flood-threatened metropolis as rivers swelled and floodwaters threatened to burst through dykes protecting the capital. Ireland’s presidential election today pitches a former guerrilla commander against a television reality show star and a politician-turned-poet. Martin McGuinness, once a leading figure in the Irish Republican Army’s fight against British rule in Northern Ireland, is unlikely to win the largely ceremonial post, but by running he has given a major fillip to his Sinn Fein party and its campaign for a united Ireland. Libya’s new rulers today said they would prosecute the killers of ousted dictator Muammar Gaddafi following the international outcry over the circumstances of his death. Rain and snow today compounded difficulties for thousands rendered homeless in the powerful earthquake that hit eastern Turkey, and the government said the death toll has gone up to 534. The PM’s centre for crisis and emergency management said 2,300 people were injured and 185 were rescued from the rubble. Militants armed with guns and explosives struck a US-run base in Kandahar today, with blasts and gunfire reverberating in the southern Afghan city, the police and witnesses said. Vice-President Hamid Ansari arrived here today to participate in the Commonwealth Heads of Government meeting where India is set to oppose setting up of a human rights monitor and reject any move to reconsider Sri Lanka as a venue of the next summit. Attempts by Tamil Tiger sympathisers to bring charges of criminal prosecution against Sri Lankan President Mahinda Rajapaksa, who is in Australia to attend the Commonwealth Heads of Government Summit, will fail as international law guarantees immunity to visiting heads of state, officials in Colombo said. The US has asked Pakistan to squeeze the dangerous Haqqani network, Secretary of State Hillary Clinton today said as she underlined that it has been made clear to Islamabad that trying to distinguish between "good and bad terrorists" is self-defeating and dangerous. 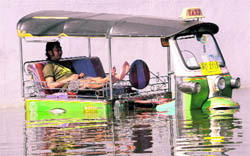 The country’s worst flooding in half a century, caused in part by unusually heavy monsoon rain, has killed 373 people since mid-July and disrupted the lives of nearly 2.5 million, until now mostly in the north and central provinces. But PM Yingluck Shinawatra, a novice politician who only took office in August, told reporters the crisis had now reached a critical point for Bangkok. As Yingluck’s voice started to tremble, reporters asked if she was crying. “No, I haven’t cried and I won’t. I’ll be strong to solve this problem for the Thai people. Right now we need to release floodwater to the sea as soon as possible and we need a quick rehabilitation plan,” she said. “We’re heading off to Hua Hin because people said it’ll be difficult, we should leave. If it gets worse, we won’t come back,” resident Pornchai Tangsuwongthai told Reuters TV. Bangkok, a city of at least 12 million people that accounts for 41 per cent of GDP, is in danger from run-off water from the north coinciding with high tides on the Chao Phraya river, which is already at a record high level in places. Bangkok Governor Sukhumbhand Paribatra, who has said many parts of the capital could be in danger by the weekend, said not all of the city would be hit. “As the person in charge of Bangkok, I believe that the water will not flood every district. Some districts might not be inundated,” he told reporters. Analysts say the race is too close to call between independent candidate Sean Gallagher, a businessman who shot to fame through reality television, and poet and former culture minister Michael D. Higgins, who is a member of the coalition government’s junior Labour Party partner. Sinn Fein, once the political wing of the now-defunct IRA, has always campaigned for a united Ireland but so far has only been able to make major political inroads in Northern Ireland. “With regards to Gaddafi, we do not wait for anybody to tell us,” said Abdel Hafiz Ghoga, vice-chairman of the ruling National Transitional Council at a news conference in Benghazi. “Whoever is responsible for that (Gaddafi’s killing) will be judged and given a fair trial.” The statement came as NATO weighed a possible new role in Libya following Gaddafi’s controversial death, as France said the UN would vote on Thursday to end the alliance’s mandate for an air war on October 31. Global disquiet has grown over how Gaddafi met his end at the hands of NTC fighters who hauled him out of a culvert where he was hiding following a NATO air strike. Mobile phone videos show him still alive at that point. Russian Prime Minister Vladimir Putin yesterday expressed his “disgust” at the global media for its graphic coverage of the ousted leader’s death. Meanwhile, a moderate earthquake, measuring 5.4 according to Turkey’s Kandilli seismology centre, hit the neighbouring province of Hakkari today, sending people rushing out of buildings in fear and panic. No damage was reported but NTV television said some people were slightly injured while trying to escape through windows. That temblor was centered 150 km south of the epicentre of Sunday’s devastating quake. A group of “three to four” armed men, possibly with suicide vests, had taken up positions in an empty compound that was once used by the USAID development agency and were firing on the base, according to the police. A NATO spokesman in Kandahar said the military had reports that one civilian foreign national and one Afghan soldier had been wounded in the attack. Five explosions were earlier heard at the base, and a sixth huge explosion later rocked the area near the base, throwing huge plumes of smoke into the sky. A senior police official said a security meeting attended by the Kandahar provincial governor, security officials and commanders from NATO’s International Security Assistance Force had been taking place at the PRT base at the time, but none of those present was hurt. Ansari, who is standing in for Prime Minister Manmohan Singh at the summit, is expected to underline that the grouping stay focused on development challenges faced by member nations and strengthen existing institutions. 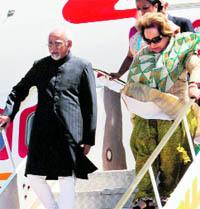 Ansari and his wife Salma were received at the airport here by Australian Defence Minister Stephen Smith and Brenden Grills, the Regional Development Minister of Western Australia. On demands by a section of members to reconsider Sri Lanka as the host of the next CHOGM summit, Ansari a decision to hold the next CHOGM in Sri Lanka was already taken in 2009. “Well, as far as we are concerned, the decision to have the next CHOGM in 2013 was taken at the meeting in Port of Spain. That is a decision and that is the end of the matter,” Ansari told reporters accompanying him to Perth. The demands for change in venue of the next summit in Sri Lanka has been raised by an influential section of members who have questioned the island nation’s record on alleged war crimes during it’s fight against LTTE. Ansari also pitched for an international mechanism to check the scourge of terrorism. “In all such meetings, the question of united action against terrorism does come up,” he said when asked whether terrorism would be discussed at the CHOGM meeting. The Vice-President flagged food security as an “important element” in the discussions at the meeting of leaders from countries, most of which were former British colonies. “If international arrangement scan be improved by which food security concerns of scarcity states are addressed, it would be a great step forward,” Ansari said. He pointed out that 34 of the 54-member nations were small states many of which face problems which are “urgent and serious” in nature. Besides issues related to economic and social development, food and energy security, the CHOGM is also expected to deliberate on the recommendations of the Eminent Persons Group for sharpening the impact, strengthening the networks and raising the profile of the Commonwealth. These recommendations also include a proposal setting up a monitoring group for democracy, rule of law and human rights. “The responsibilities spelt out in this would seem to undermine the role of both the Secretary General and the Commonwealth Ministerial Action Group (CMAG) itself which is actually dealing precisely with these issues,” Foreign Secretary Ranjan Mathai had said. President Rajapaksa is in Australia amidst growing threats from the pro-LTTE lobby there who are angered at his visit as well as Sri Lanka being named the next host of the Commonwealth Heads of Government summit in 2013. The chairmanship of the Commonwealth is to be handed over to President Rajapaksa at this summit dispute protests from several human rights groups who have written to member nations asking that this opportunity be not given to Sri Lanka citing continued violations for human rights in the country. A Tamil national living in Australia has filed a case with the Attorney General Department there seeking charges against the Sri Lankan President. The International Commission of Jurists, which is also calling for war crimes probe against the Sri Lankan President, has submitted that immunity would not be a barrier to this prosecution. "Our commanders on the ground are increasingly concerned about the ability of insurgents to conduct attacks from safe havens across the border in Pakistan," Clinton told members of the powerful House of Representatives' Committee on Foreign Affairs during a Congressional hearing on Pakistan and Afghanistan. Testifying before Congress after a trip to the region, Clinton said she delivered a "frank" message to Pakistan that it was urgent to act against the extremist Haqqani network, which she blamed for anti-US attacks in Afghanistan. "So in Islamabad last week, General Dempsey, Director Petraeus and I delivered a single, unified message. We urged Pakistan's civilian and military leadership to join us in squeezing the Haqqani Network from both sides of the border and in closing the safe havens," she said. "I explained that trying to distinguish between so-called good terrorists and bad terrorists is ultimately self- defeating and dangerous. No one who targets innocent civilians of any nationality should be tolerated or protected," Clinton said. The Secretary of State was in Afghanistan and Pakistan along with the Chairman of the Joint Chiefs of Staff, General Dempsey, and the CIA Director, David Petraeus.